What Journalism Could Be asks readers to reimagine the news by embracing a conceptual prism long championed by one of journalisms leading contemporary scholars. A former reporter, media critic and academic, Barbie Zelizer charts a singular journey through journalisms complicated contours, prompting readers to rethink both how the news works and why it matters. Zelizer tackles longstanding givens in journalisms practice and study, offering alternative cues for assessing its contemporary environment. Highlighting journalisms intersection with interpretation, culture, emotion, contingency, collective memory, crisis and visuality, Zelizer brings new meaning to its engagement with events like the global refugee crisis, rise of Islamic State, ascent of digital media and twenty-first-century combat. 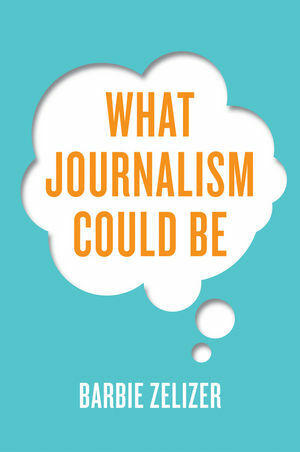 Imagining what journalism could be involves stretching beyond the already-known. Zelizer enumerates journalisms considerable current challenges while suggesting bold and creative ways of engaging with them. This book powerfully demonstrates how and why journalism remains of paramount importance. A former journalist, Barbie Zelizer is the Raymond Williams Professor of Communication, and the Director of the Scholars Program in Culture and Communication, at the Annenberg School for Communication at the University of Pennsylvania.